Below is a press release I received from the Royal Mint about their newly released Henry VIII commemorative. 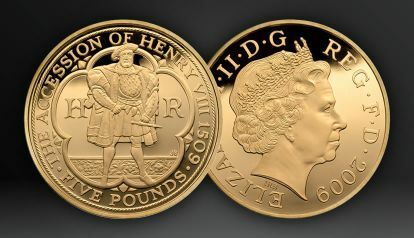 As the United Kingdom celebrates 500 years since Henry VIII acceded to the throne, the Royal Mint has captured the spirit of the occasion with a special gold coin. Commemorating a reign which instigated the Golden Age in English History, the Royal Mint pays tribute to one of England’s greatest monarchs with a limited edition Crown coin, featuring the iconic and striking figure of Henry VIII himself. Only 1,509 of these precious metal coins have been minted - 1509 being the year Henry was crowned - and are available now for £1,195 each. The coin is also available in cupro-nickel, silver Proof and Platinum Piedfort, with prices starting at £9.99. The Royal Mint’s coin shows the great king standing before a frieze of roses in the ‘antique’ style much favoured in the carvings and tapestries of the period. The edge of the coin features a Latin inscription ROSA SINE SPINA, which was also used on Henry VIII’s own coinage and translates as ‘Rose without a Thorn’. Additional details include the initials HR (Henry Rex) which represents his personal monogram and a rope border surrounding the coin’s design which symbolises the Royal Navy. In addition to the gold coin, the new £5 Crown is also available in Platinum Piedfort, sterling silver and cupro-nickel. The Platinum Piedfort coins, priced at £4,400.00, are likely to be the most sought-after as only 100 of these have been made. 10,000 of the silver Proof coin have been produced, priced at £44.95, while the cupro-nickel Brilliant Uncirculated £5 coin is available for £9.99, with a product issue limit of 100,000. The Platinum Piedfort Henry VIII coin come complete with an individually numbered Certificate of Authenticity signed by the coin’s designer John Bergdahl. The Brilliant Uncirculated coin is housed in a beautifully presented folder containing a wealth of information on Henry’s life and his actions that changed the face of the kingdom. For further information or to purchase your coin set, please call the Royal Mint on 0845 60 88 222 or visit www.royalmint.com.